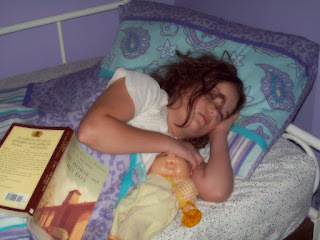 This is the "sleeping angel" pic I snapped for the contest over at 5 Minutes for Mom. They are giving away a new set of bedroom furniture to the lucky little angel who wins! I would love to have the Lily Rose set for Miss Ashley! I love this pic because it is just so "her". She has her baby to snuggle with, her half read Narnia book, and she looks so peaceful. My favorite thing is the crazy hair with the lone wild curl going over her eye and nose. Who can sleep with hair in their face?! She's so funny! I am so blessed. So, click here to go over and check the contest out! Contest ends Monday, October 13th at 3pm EST. Have fun looking at all the adorable sleeping angels and good luck!